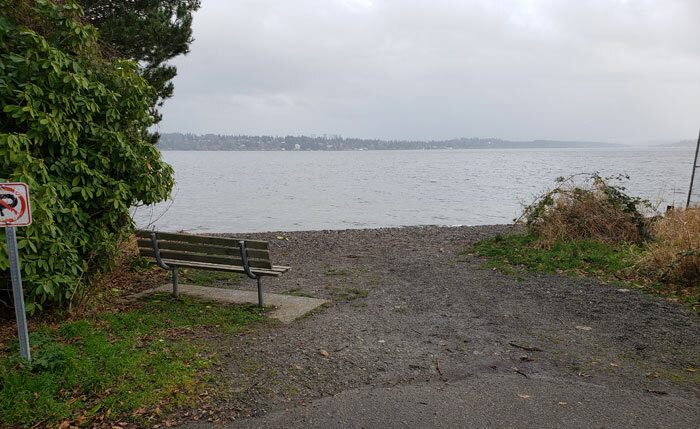 Photo by Brandon Macz: A work party to clear invasive blackberry bushes from the East Prospect shoreline street end in Madison Park is planned for Saturday, April 27. After years on pause, the East Prospect street end in Madison Park is going to get some TLC. “We are really proceeding with developing the planting plan for the East Prospect street end,” said resident Gene Brandzel, who has been leading efforts to make shoreline street-end improvements in Madison Park for many years. He and his wife continue to steward the Beaver Lodge Sanctuary, a long-term habitat restoration project at the end of 37th Avenue South. Efforts by the Madison Park Community Council to rehabilitate the East Prospect street end in 2015 were stymied by protests by a property owner to the north of the site. “He was imposing all kinds of requirements on us to avoid having him make a big stink about it, so we just decided at that point the hassle wasn’t worth it,” Brandzel told MPT for a feature on shoreline street ends in February’s edition of the paper. Now that the concerned party has sold, Brandzel is organizing an April work party to clear blackberry bushes and other invasive vegetation. “It’s a big project, and it’s mostly blackberries that need to be removed,” Brandzel said. The street-end project will be helped along with support by the city’s Trees for Seattle and Shoreline Street Ends programs in the form of tools, waste containers and volunteers. The Madison Park Community Council is also providing financial support. The tennis club has an entrance off 41st Avenue East that would benefit from an improved street end, Brandzel said, and has agreed to help keep it maintained. The work party is planned from 9:30 a.m. to 1:30 p.m. Saturday, April 27, at the end of East Prospect. People should wear long-sleeve shirts and pants to protect them from blackberries. Gloves will be provided, but people can also bring their own pair. Brandzel expects it will only take one party to clear the street end.